What one person finds complicated, another finds simple. And as he said that, I realized that perhaps it’s not simple. But if you want to take portraits, then it should be. In other words, without knowing how to do a “traditional” portrait setup, it is hard to do creative portraits. No, that does not mean you need to make all portraits traditional – you can do great stuff with one off-camera speedlight and a grid. A backdrop (paper roll, here). A main, or “key” light, in this case a Bowens strobe with a softbox. A fill light (Bowens strobe with umbrella, in this case). A hair light (speedlight with Honl Photo grid and egg yolk yellow gel). A background light (speedlight with Honl Photo blue-green gel). A way to drive them: Here, I used one strobe and two speedlights fired by pocketwizards; one strobe by the light-sensitive cell. Metering: I used light meter to arrive at f/9.0 at 100 ISO and 1/200th second. Ratios: I set the fill two stops darker than the key. And the hair and background light by trial and error (I got them right first time – done it before). Anyhow – parsing makes things simpler. If you are faced with a complex situation, parse it, i.e. take it apart, one thing at a time. Analyse each layer until you understand it, then go on to the next layer. And before you know it, you will be saying “that’s simple”. That’s what you learn when I teach you: how to make complex situations simple by understanding the elements, then building on those. Deductive learning, if you will. 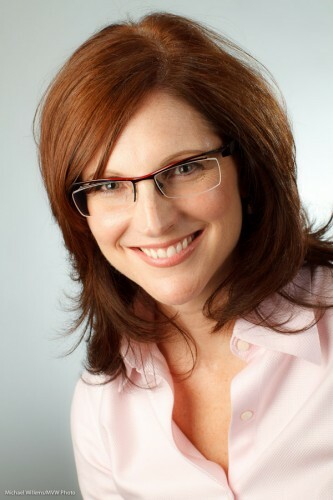 A plug, if I may: if you, too, need an updated headshot, and live in the Greater Toronto Area, do call me. For Facebook, your resume, LinkedIn, or your web site: a good headshot helps, and Headshots Specials are on during the month of September! Sunday morning, around mid-day, in downtown Oakville I shot a fashion shot for a magazine front cover. Outdoors fashion is, as always, a matter of many things coming together at once. One of those is light. Without light, even on a wonderful overcast day (wonderful in photo terms), the image lacks something. The mother and daughter models lack a certain je-ne-sais-quoi. I set my camera to manual. I select 1/200th second and 100 ISO. 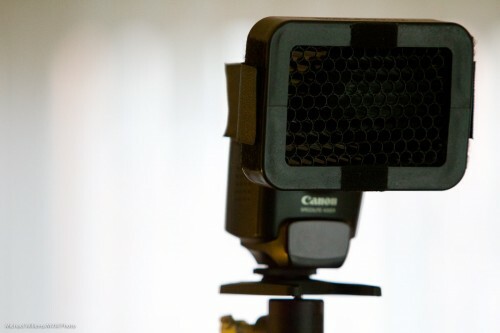 I now add the strobe, set it to 80% power about 6ft away, and test this with the meter (now set to flash mode). Well have you ever: the meter immediately indicates f/5.6! (This is just experience. If you are less experienced, no worries – just turn the light up and down until you do read f/5.6). Okay, we are set. If the sun comes out a little more, I go to 1/250th, and if it gets a tad darker I go to 1/160th. Notice the speedlight with a blue-green gel as accent/hair light on our right? The speedlight was held by Kurt, who assisted on this shoot, and was set to 1/4 power (again – experience tells me that setting will probably work – and it did). The final step is to make that an egg-yolk yellow gel instead of a blue-green gel – yellow accentuates the late day setting sun feeling that is synonymous with autumn. (I use Honl Photo gels). And there we have the image. (In fact this is not quite the image – that one went to the client, and I do not like to publish images in this open forum before the customer has used them!). Also – note that these are shot a little wide since this is for a magazine front page, so there needs to be space for text. Umbrellas and softboxes outdoors will be blown away, so hold on tight. If the models move, use AF-C/AI Servo focus mode. With two models, be very aware of the danger of blinking – one of them will blink in very many images, so check, and take many images. When you shoot Nikon and use the CLS/iTTL systen, you can fire remote flashes and set them to manual instead of TTL. This is well known since you set the options through the on camera menu. 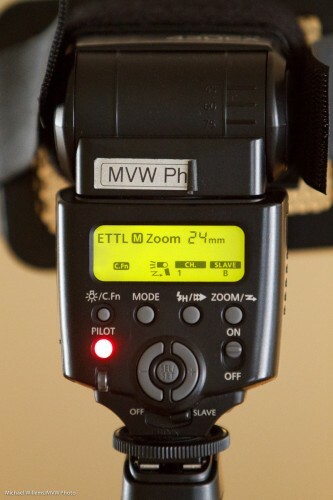 In the Canon world, this is not possible: remote flashes operated by light control must use TTL. Right? Wrong. Canon too supports this functionality. So it’s a TTL flash set to slave mode. 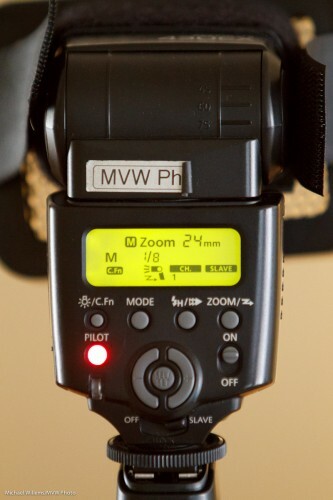 Now your cannon flash is still in slave mode, but it is now in manual power mode – TTL will not meter: the flash will just fire at whatever level you set it to (1/8th power, in this case). Note that the “M” to the left of the “1/8” now flashes, to remind you. One press and it goes back to TTL mode. I bet there are some here who did not know this! Yes, you can use light-operated remote slaves that you set to manual, even in the Canon world. PS: what’s that on the front of the flash? A Honl Photo speed strap plus a Honl 1/4″ grid. Welcome, all, including new students and reader. 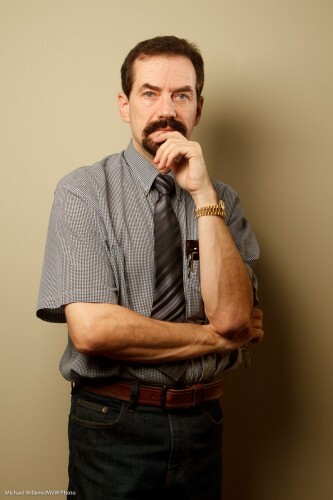 Continuing in the studio lighting technique series of posts, today, let’s look at the effect of a background light. That was lit with one strobe in a softbox on our left. Simple, nice, soft light. But wait. Perhaps a little more light on the background would help offset the model from the background a little better. 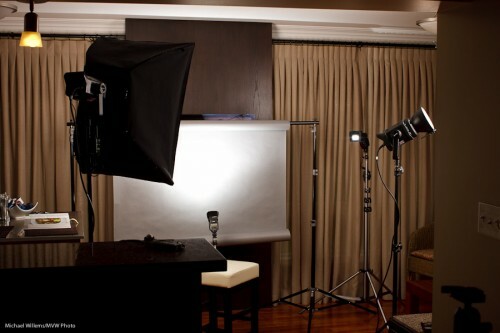 For this, we use a speedlight, with a grid (so as to avoid the light going everywhere). And that gives us very different light. Now we could turn that background up, or down; or change the direction. The point is that this allows us to play with “foreground versus background” a little. Offsetting your subject from the background is always good – dark background and light subject or light subject and dark background are both good. There’s no one way – it’s more that there are a number of ways of doing things. And by controlling liught, you control those ways. Here is a self portrait, and the process that went through my head making it. I thought that would be good to share. Here’s how to make a dramatic self-portrait in ten steps. 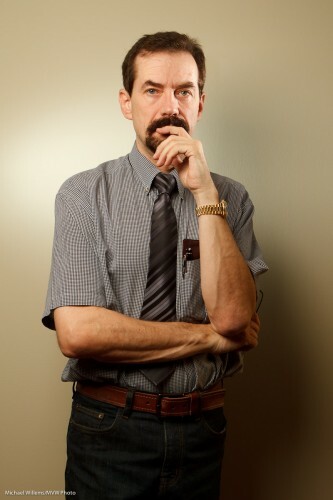 First, I thought “let’s do a quick self portrait, indoors, lit by simple TTL flash”. I then thought “But let’s make it off-camera flash”. 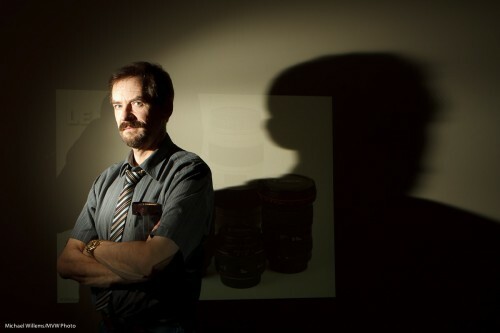 I went on to think “I want a dramatic image, so let’s use only flash light: available light should play no role”. To achieve that, I set my camera to manual exposure, 1/125th second, f/5.6, ISO 100. I took a test shot: black. Good, just what I wanted. Next, I aimed a single 430EX flash in slave mode at the wall diagonally from the side. Next, I attached a 1/4″ Honl Photo grid to the flash to avoid lighting up the whole wall; instead, I cast a nice parabola. That grid is my most used accessory, I think. I added a projected image of a set of lenses, only just visible. Now I put myself into that parabola: light straight into my face. Diagonal to the camera. I selected an almost-standard lens length (28mm on a Canon 7D, meaning a “real” 45mm) and off-centre composition, with a heavy shadow dramatically cast by me onto the wall. Finally, to take the shot I would have used a tripod, but since I had a student available, I asked her to shoot for me (Kayleigh, you know who you are). And the result? Here it is. What do you think? Me to a T, eh? This entire shot took just a few minutes to set up. You can do this too!